You’re standing in the middle of the grocery store on the toothpaste aisle, lost. It used to be just toothpaste, right? But now, there are dozens of brands and multiple formulas within each brand and it’s all so overwhelming that it makes you want to go to the candy aisle instead, because you already know that Baby Ruth is your favorite. But hang on. Not only is a candy bar not the best food for your teeth, but toothpaste options can be a good thing if you know what to look for! In today’s market, you can find a toothpaste that’s right for your mouth—one that helps whiten teeth or reduce the pain of sensitive teeth. So how do you choose the right option for your needs? We’ve broken down your search into some easy-to-digest steps below. “Choosing a brand can be tricky because there are just so many options,” Dr. Ada Cooper, a New York dentist and spokesperson for the American Dental Association (ADA). In an article for Prevention magazine, she says the first thing you should do is search for the ADA seal on the box. “This shows the product has been tested, its claims are legitimate, and its ingredients are effective,” she advises. This is because while the FDA requires toothpaste manufacturers to meet certain guidelines, they do not test all these products for compliance. The ADA conducts extensive product testing to ensure that the products meet required FDA standards for safety and effectiveness. Most products that carry the ADA seal and claim to fight cavities will do the job right, but beyond that, you may want to choose a product that helps to solve a more specific problem. Here at Gladstone Family Dentistry, we also recommend finding a product with fluoride, which makes our teeth nearly ten times more resistant to the acids that break them down. In particular, having fluoride available when our teeth are forming (birth till about age 12) is especially beneficial to make them strong from the inside out. Fluoride as an adult works on the surface in a similar way. Tartar stems from bacterial plaque that becomes hardened. (It’s that pesky coating that your dental hygienist scrapes off during cleanings.) While there are “tartar control” toothpastes on the market, we advise against using them, as they can contribute to gum sensitivity. Daily home care is the best way to deal with tarter. If you have questions, ask our dental hygienist about the best way to keep your teeth free of tarter. The good news is, you can manage sensitive teeth and gums it with the right toothpaste. 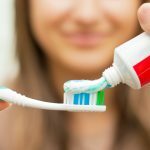 A toothpaste formulated for sensitive teeth will contain compounds like potassium nitrate that help block the painful sensation traveling from the tooth surface to the nerve. And since tooth sensitivity occurs when the enamel that protects our teeth becomes too thin, you also want a toothpaste that will remineralize and strengthen tooth enamel to help reduce sensitivity over the long haul. Two toothpaste options that come highly recommended by many dentists are Sensodyne Repair & Protect and Colgate Sensitive Complete Protection, both of which contain potassium nitrate to sooth nerve pain and help to strengthen and protect the tooth structure. Keep in mind that it may take several applications before you notice a decrease in tooth pain and sensitivity, and then continued use to keep that sensitivity in check. While you may be tempted to seek out a product to whiten your teeth, it’s important to understand that not all whitening products are worth their weight in gold—and some can even harm your teeth. That’s because many over-the-counter whitening toothpastes and products work by being abrasive to your teeth—by taking off a thin, micro-layer of protective enamel. This can lead to enamel weakening, tooth sensitivity and other problems. Here at Gladstone Family Dentistry, we prefer to steer clear of most over-the-counter whitening products, as they tend to only remove some surface staining and they can really irritate your gums and cause painful teeth sensitivity. Most whitening toothpastes are too acidic, and the acid-loving bacteria are the ones causing cavities! Our favorite toothpaste, however, is CTX 3 and CTX 4, which we sell in our office and is made by Oral Biotech, a company in Albany, Oregon. Both options have a very high pH and contain xylitol, which means they fight against the harmful bacteria that cause cavities. This toothpaste also has calcium and phosphorus ions in correct proportion to help keep the surfaces of our teeth and roots mineralized. The CTX 4 version adds fluoride for added benefit. Better yet, schedule an appointment with us today to learn about our professional, in-office whitening treatments! Our whitening technology doesn’t harm or strip your teeth like some over-the-counter products, and we can ensure that you achieve a whiter smile safely.